I watched the entire Original Series of Star Trek during a hot summer in Tunisia in 1993. 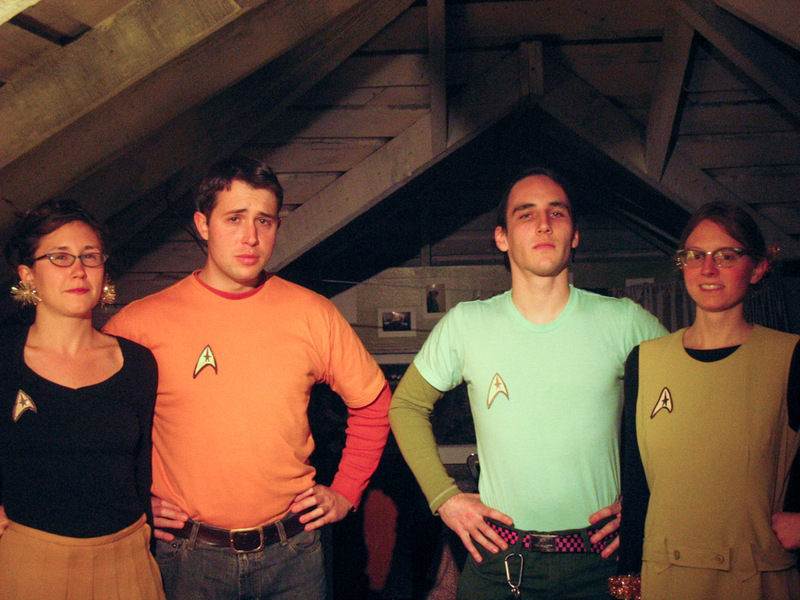 From those days onward my friends Mo and Will became Mr. Spock and Captain Kirk and I assumed the alter-ego identity of Doctor “Bones” McCoy. I don’t know why we identified with the characters, perhaps in part from a sense of optimistic people — friends — working together towards a common goal, in exploration of the cosmos and a vision of a universe where we have left the divisions of our planet behind. Shortly Before the Alien Apocahoppalypse Party, Playground Cooperative House, Oakland, California, February 2007. Photograph by Margo or Kim. Star Trek and its spin-offs have proven highly popular in syndication and are shown on TV stations worldwide. The show’s cultural impact goes far beyond its longevity and profitability. The franchise inspired some designers of technologies, the Palm PDA and the handheld mobile phone. Michael Jones, Chief technologist of Google Earth, has cited the tricorder’s mapping capability as one inspiration in the development of Keyhole/Google Earth. The Tricorder X Prize, a contest to build a medical tricorder device was announced in 2012. Ten finalists have been selected in 2014, and the winner will be selected in January 2016. Star Trek also brought teleportation to popular attention with its depiction of “matter-energy transport”, with the famously misquoted phrase “Beam me up, Scotty” entering the vernacular. The Star Trek replicator is credited in the scientific literature with inspiring the field of diatom nanotechnology. In 1976, following a letter-writing campaign, NASA named its prototype space shuttle Enterprise, after the fictional starship. Later, the introductory sequence to Star Trek: Enterprise included footage of this shuttle which, along with images of a naval sailing vessel called the Enterprise, depicted the advancement of human transportation technology. When she told Roddenberry what King had said, he cried. Last year, I cried, too. I watched most of the episodes of The Next Generation, probably my favorite television series, with a Shakespearean Captain Picard leading a cast and crew in at times playful and at others intense episodes, one of the best being The Measure of a Man. I’m looking forward to living in a world closer to the one depicted in the series, so here’s to another 50 years. I’m on my way to Leonard Nimoy station orbiting Vulcan in the LHS 3006 system of the Elite simulation, to celebrate virtually, and tomorrow I’ll continue with some Earth IPA ales from a physical tap in a contemporary version of Ten Forward somewhere close by. Maybe I’ll meet Whoopi there! McCoy to Riker: I’m a doctor, not a politician! PS. If you like Star Trek or science fiction I recommend Iain M. Banks’ Culture novels. So far I’ve read Consider Phlebas and it is excellent.